I used to think singing was the most fun we had at church. And when the congregation moved into the new sanctuary I was fascinated with the new box Miss Jean played, called a “organ.” I had never heard of one. 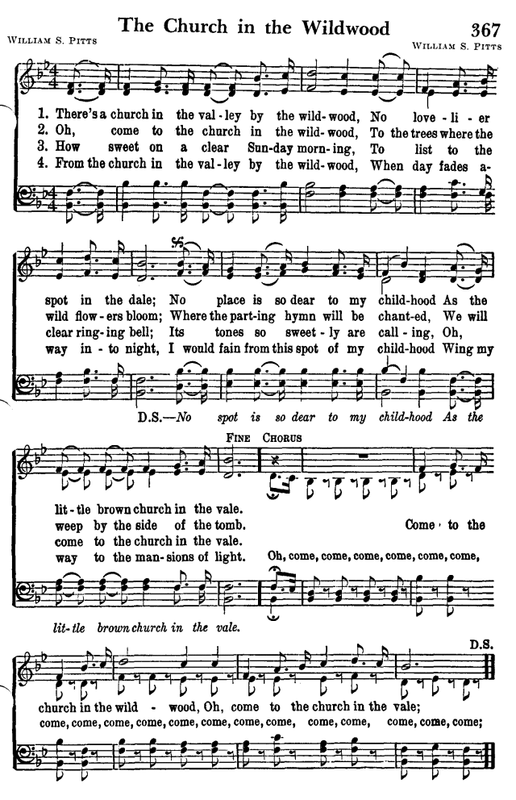 I soon learned the numbers of my favorite songs in the “Cokesbury Hymnal,” the little brown book that was placed as a supplement in the pew racks of our church. It was filled with singable, old songs, and it fit better in a child’s hand. Numbers 121, 95, 153 were my favorites. You had to know your number to holler it out when they asked for a request. This was the lifeblood of my personal spirituality when I was kid. I loved it when we had a quartet come sing for a Sunday evening. The Victory Trio was one that came and filled our little church with the sound of 1970s Southern Gospel. Big ole speakers would be placed in the front and we’d hear opinions on how much they didn’t need those for weeks after the singing was over. Then one Sunday we hosted the Emory & Henry College Concert Choir. I don’t think I was able to close my gaping mouth during the entire concert. They were awesome. College kids were so grown-up like, and they were all dressed so fine in their long dresses and tuxedos. When they sang, the sound just enveloped the room, and reverberated with depth that went all the way down into the bottom of your heart. They were under the direction of a man from Tazewell, Virginia by the name of Charles R Davis. “Chick” was a former football standout-star at the college, having played in some important matches during his student days. He went to grad school at Westminster Choir College where he learned some wonderful techniques that gave the choir he founded at Emory & Henry its signature sound for many years. In this concert at my home church they sang a beautiful piece from “The Seven Last Words of Christ” by Dubois. “Father, father, father, forgive them,” began the bass soloist, answered by the tenor: “And the people clamored” then the chorus: “He is death guilty, he is death guilty, let us crucify him!! !” The drama and the beauty of the sound was mesmerizing. Sometime during this concert I made up my mind to go to this school. Later in the concert they sang pieces from the Black Gospel tradition, songs like “Ain’t Got Time to Die” by Hall Johnson. The soloist begins “Lord, I keep so busy praising my Jesus” answered by the same words from the choir, with “Ain’t got time to die” as the main phrase. “If I don’t praise him, the rocks’ gonna cry out!” This music at good volume by young voices was so energetic and moving I just wanted to keep hearing it. This choir did indeed draw me to the college in 1982 upon graduating from High School. In the time between that concert and the time I got there, my sister had also gone there and majored in music. I went with the idea I was going to study religion. After all, Emory & Henry was founded by Methodists. One of the high points of my time in the Concert Choir was the work we were given to do in giving world premiere of a work by Randall Thompson, a pretty famous American composer, who wrote his final choral piece, the “Twelve Canticles,” and dedicated it to our choir. We were on National Public Radio and our local Public radio station at Johnson City, TN broadcast the entire concert. Thompson’s work was a beautifully, typically haunting set of verses which he chose and set to music that blended from one to the next. “God is a Spirit” is perhaps the most hallowed of the set. You may view the choir singing it under Doc Davis’s direction at a Homecoming Concert (with choir alumni) in the college chapel at this link. I was able to sing some with the Divinity School Choir at Duke University and even tried singing with the Chapel Choir at Duke, although I just wasn’t cut out for their style. Voice lessons with Chick Davis were aimed at different outcomes than what these choirs needed. But I’ve always loved the Emory & Henry choir, even if the songs were a bit highbrow for my upbringing. Some of my favorite memories have been times I’ve been in churches, of all sizes, singing and listening to others sing. I still think that’s the most participatory thing we do in church. Joining our voices together in common praise is a blessing. Listening to others praise God with their voices is also a blessing. Whether singing with the children’s choir in our white robes with the big red bows on them, or singing in a country church somewhere in our street clothes, or singing in a college choir with a tuxedo on, music is truly a gift God has given us to help us deal with the many seasons and moods of life while aiming our praise toward the Author of our salvation.